Diaphragm Check Valves are Superior to "ball checks" The patented diaphragm in the Plast-O-Matic True Blue Check Valve is designed to re-seat with a bubble tight seal regardless of mounting position or reverse flow. 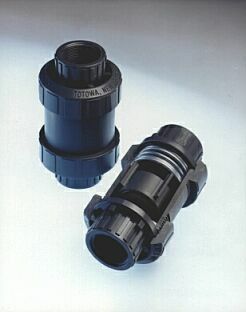 Ball style check valves require two properties to seal properly: First, the ball check must be mounted with the flow direction pointed up, because gravity is required to pull the ball to the seat. Secondly, some reverse pressure and flow must be present, because pressure is required to seal the ball exactly on the seat. If either of these conditions are not met, the ball check will leak! On the other hand, the Plast-O-Matic diaphragm check will seal in any position, whether or not flow is present. Here's a Simple Test: Take a Plast-O-Matic diaphragm check valve and place it flow arrow up on a paper towel. Pour a small amount of water into the outlet, lift up the valve, and you will see that it has remained absolutely sealed -- no evidence of dampness on the paper towel. Now take any ball-style check valve and perform the exact same test -- just be sure to have extra paper towels on hand! Plastomatic CKS Self-Closing PVC Check Valve - 1-1/2"
Plastomatic CKS Self-Closing PVC Check Valve - 2"
Plastomatic CKS Self-Closing PVC Check Valve - 3"
Plastomatic CKS Self-Closing CPVC Check Valve - 1-1/2"
Plastomatic CKS Self-Closing CPVC Check Valve - 2"
Plastomatic CKS Self-Closing CPVC Check Valve - 3"